The Sky Pirates are invading Guild Wars 2! They might have done it sooner, but first they had to stop off at a steampunk convention. And then they had to stop off again to have a massive brawl in a watchmaker's shop. But now, finally, they've arrived in Tyria - cogs and all - to star in this trailer round-up of the features being added in today's update. Initially, that means a new story dungeon - Aetherblade Retreat - available until July 9th. Then next week, ArenaNet will unlock Not So Secret, a new jumping puzzle that will remain as a permanent addition to the game. The update will also introduce a massive round of tweaks to Skills and Traits. You'll not see those in the trailer, because '25% reduced cooldown' is a slightly more abstract concept than 'a pirate'. You can, however, read up on the changes through a comprehensive (albeit unconfirmed) list that's surfaced on Reddit . In terms of items and rewards, an official ArenaNet guide explains what's available. 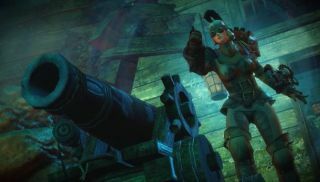 Sky Pirates of Tyria will launch later today.